Just another backyard rope swing. The Right to be Stupid shall not be infringed. He’s sure it’s in the Constitution somewhere . . . probably right next to that whole separation of church and state thingy. And if there’s one thing that the Obama administration in general – and John Kerry throughout his political life, in particular – embodies is stupid. This is doubly true if you treat “stupid” and “wicked” as synonyms, which they are if you consider the eternal implications. Which we’d better. They owe their collective political lives to stupidity. Their own stupidity and the stupidity of those that elected (and keep electing) them to office. I exaggerate, you say. Consider that the current Secretary of State calls himself a Catholic, yet unreservedly endorses child-killing. Consider that he was the liberal Senator from the People’s Republic of Massachusetts – even before Ted Kennedy assumed room temperature. Consider that he picked John Edwards as his vice-presidential (or was that president in charge of vice?) running mate. Consider that he got a purple heart for his military service upon suffering an ingrown toenail in the heat of battle. Consider that he’s not just the poster boy for botox; he’s the poster boy for really, really bad botox. Yep. Stupid. 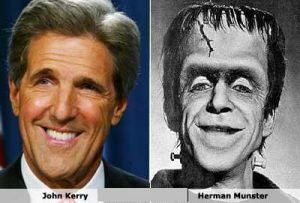 John Kerry was in favor of stupid long before he was against it . . . oh, wait, he’s actually always been in favor of stupid. About the only smart thing he’s done is marry Theresa Heinz Kerry. Even that one’s a close call. By my estimation he’s earned every penny of that money. On his first official trip as Secretary of State, Kerry is in Germany extolling the virtues of stupid. As if his audience needed proof, Kerry shared one of his childhood adventures during which he “snuck out of the American embassy in divided postwar Berlin at age 12 for a clandestine bicycle ride into the Soviet-controlled eastern part of the city.” Not sure, but I think Bill Clinton used to sneak out of the White House using the same method. Kerry continued, “I saw the people wearing darker clothing. There were fewer cars. I didn’t feel the energy or the movement.” Hmmm. Dark clothing. Fewer cars (wait, isn’t that the goal: getting rid of evil, polluting cars?). No energy; no movement. Mr. Secretary, take some Maalox and leave us alone. Ever the thespian, Kerry segues from stupid to tolerance. In fact, he tolerates everything but intolerance. Tolerance is “something worth fighting for,” he explained. “We live and breathe the idea of religious freedom and religious tolerance, whatever the religion – and political freedom and political tolerance, whatever the point of view,” he said. This is the tolerance of Ceasar. Just bend your knee and say “Ceasar is Lord” and you are free to go. Don’t want to do that? Is that my stomach growling, or is it one of those lions in the arena? Don’t want Obamacare? How do you feel about being impoverished by the government and then housed for a decade or so in federal prison? Just bend (over) and you are free to go. Never mind that pesky eternity in torment thing. We all know how intolerant the God of the Universe is about having other gods before Him and all. So when this international moron is talking tolerance and religious liberty, he is banking on the stupidity of the American public, which is a given. Feel good video of the day. Seal of Approval from Jason Neilus on Vimeo. Some interesting (good?) news from the Vatican.